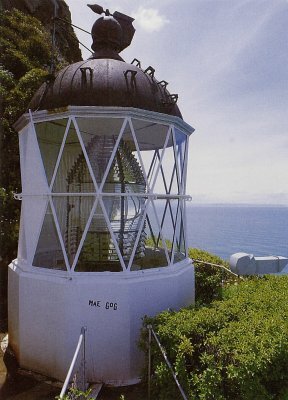 The Godley Head Lighthouse has been safely removed onto flat land where it is now safe. It is hoped that it will be restored to working order and provide another attraction at Godley Head. An initial attempt failed when it was found to be too heavy for the helicopter to lift. Even with the glass removed it remained to heavy. However, a successful lift was achieved when the copper canopy was taken off so that the structure could be lifted in sections. Removing the canopy was not without difficulty as the bolts had rusted into place. Thanks to the abseilers who were willing to go into the precarious location of the lighthouse to make the rescue possible. Thanks also to the team from DOC who ensured that it would happen and were not deterred by the initial failure.